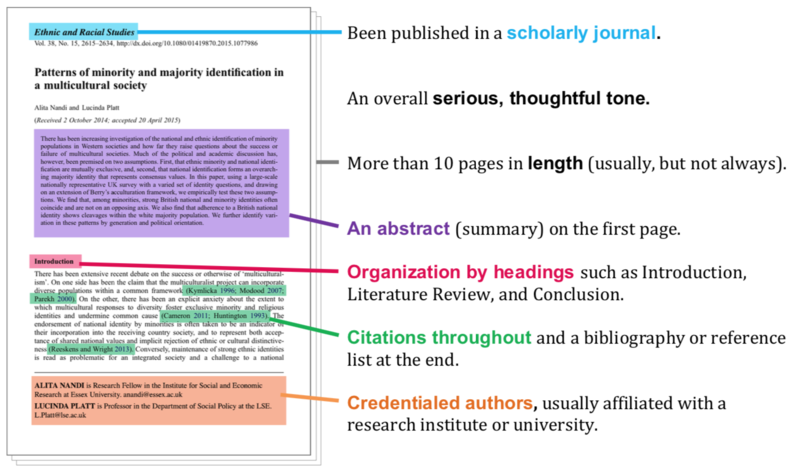 Anali Perry, a librarian from Arizona State University Libraries, gives a quick definition of a peer-reviewed article. The Library Minute: Academic Articles from ASU Libraries on Vimeo. How Do Peer-Reviewed Articles Differ From Popular Ones? When you are determining whether or not the article you found is a peer-reviewed article, you should consider the following. Does the article have the following features? Is the journal in which you found the article published or sponsored by a professional scholarly society, professional association, or university academic department? Does it describe itself as a peer-reviewed publication? (To know that, check the journal's website). Did you find a citation for it in one of the databases that includes scholarly publications? (Academic Search Complete, PsycINFO, etc.)? Read the database description to see if it includes scholarly publications. Is the topic of the article narrowly focused and explored in depth? Is the article based on either original research or authorities in the field (as opposed to personal opinion)? Is the article written for readers with some prior knowledge of the subject? If your field is social or natural science, is the article divided into sections with headings such as those listed below? Read the database description to determine if it features peer-reviewed articles. When you search for articles, choose the Advanced Search option. On the search screen, look for a check-box that allows you to limit your results to peer-reviewed only. If you didn't check off the "peer-reviewed articles only" box, try to see if your results can organized by source. For example, the database Criminal Justice Abstracts will let you choose the tab "Peer-Reviewed Journals." Watch this video through to the end. It will show you how to use a library database and how to narrow your search results down to just peer-reviewed articles. << Previous: Should I Trust Internet Sources?